In 1999, two men went hunting for buried treasure in the Seigelroda Forest in Saxony-Anhalt, Germany near a town called Nebra. Though they didn't find traditional treasure, their metal detectors led the unlicensed artifact hunters to an equally unbelievable find: a collection of two bronze swords, two hatchets, a chisel, bracelet fragments, and, according to UNESCO's Memory of the World Register, "one of the most important archaeological finds of the 20th century." 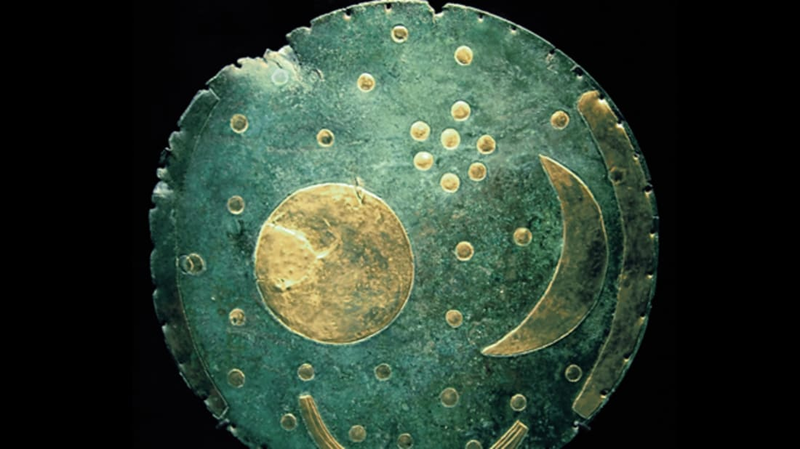 That find was the Nebra sky disk, a bronze disk with a blue-green patina and inlaid gold shapes. These symbols appear to be a full moon (or possibly sun), a crescent moon, and stars, including a cluster that likely represents Pleiades. That might not seem so remarkable, but the Bronze Age artifact has since been dated to 1600 B.C. and is the oldest-known depiction of cosmic objects in all of human history, as well as the first known portable astronomical instrument. As you might expect, the illegality of the excavation wasn’t a concern for the treasure seekers. They took to the black market and the collection gained notoriety within a few years, selling for as high as one million Deutsch Marks (about $590,000). Then, in 2002, archaeologist Herald Meller joined forces with state police to get a hold of the Nebra sky disk. Meller set up a meeting to purchase the artifact, and as soon as the object appeared, authorities descended. Archeologists then confirmed the authenticity of the disk and were shocked and delighted to find it was the real deal. They still don’t know when it was made or why, but say it was buried about 3600 years ago. The disk is 12 inches in diameter and weighs nearly 5 pounds. While the blue-green color seems apt, the disk was probably a golden brown when it was first rendered and corroded to its current hue over time. In addition to its celestial bodies, the piece contains two golden arcs (added later) at the edges which correspond to the angle the sun travels between the summer and winter solstices for the latitude at which it was discovered. Of course the object leaves much to be debated, but scholars can all agree that the shapes are definitely heavenly. The Nebra sky disk now sits in the State Museum of Prehistory in Halle, Germany.